Some places just resonate with your soul. For me, Grosvenor Arch is one of those extraordinary places that inspires. It may be its massive presence towering 150 feet above the earth. It could be the rugged and remote landscape that surrounds it. Whatever it is, there was a peaceful magic here that I didn’t want to leave. Poised on the edge of a remote sandstone ridge, Grosvenor Arch is a natural double arch spanning 92 feet across. Backed by rugged southern Utah wilderness, Grosvenor Arch is one of the most photographed formations in Grand Staircase Escalante National Monument. In fact, the arch was named in 1949 by National Geographic Society photographers, in honor of the society’s president Gilbert Hovey Grosvenor. 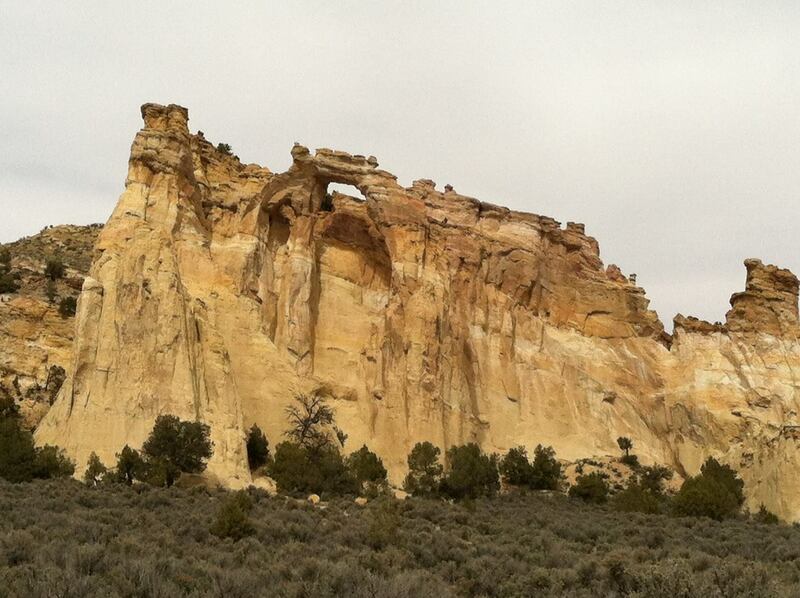 Grosvenor Arch is located about ten miles southeast of Kodachrome Basin State Park along Cottonwood Canyon Road. There is a paved path leading from the parking lot about halfway to the arch, making it wheelchair-accessible and stroller-friendly for viewing. The path is also pet-friendly. A short hike along a dirt path leads to the arch, where visitors can scramble around the base, or sit and ponder this majestic natural wonder. There are picnic tables and restrooms near the parking lot. Camping is permitted. Always remember that this is a remote region, so pack plenty of water and supplies, and be sure vehicles are in good working condition with a full tank of gas. April to June and September to October are the best times of year to visit. It is fully exposed so it can get hot in the summer. Check weather and road conditions before heading out.